Kuchipudi dance form’s woes seem to never end! Just when you think everything might be going fine, something inevitably pops up exposing the undercurrents within the Kuchipudi fraternity. This year’s Central Sangeet Natak Akademi awardees in both senior and junior categories had the whole community up in arms. For once, everyone had their eyebrows raised in confusion when these names were announced. Almost no one in the larger dancer community has ever heard of both these names, so naturally everyone was puzzled at how a prestigious body like SNA had given awards to these artistes. Before one gets into these details, it is important to go through a brief history of Kuchipudi itself. Conceptualized as a dance-drama format with an antiquity of many centuries, Kuchipudi became popular along the same time Bharatanatyam was being ‘reconstructed’. The earliest gurus were practitioners from the famous Brahmin families in Kuchipudi village in Andhra Pradesh. The all-male form was democratized by the veteran Guru Vedantam Lakshminarayana Sastry and further stylized by Vempati Chinna Satyam. They encouraged the participation of women and worked towards bringing about a more presentable aesthetic. This was highly resented by the purists within the community who felt a breach of contract. It was meant to be an all-male tradition and in Andhra women who performed came from other castes and communities. The Brahmin families that performed Kuchipudi looked down upon them. Moreover the qualifications required to be a full-fledged Kuchipudi performer were numerous. According to the notes of veteran Banda Kanakalingeshwara Rao, a Kuchipudi dancer had to be proficient in Carnatic classical vocal music, mridangam, read, write and speak Telugu and Sanskrit, have a strong knowledge of history, epics, poetry and prosody, be able to manage one’s own makeup and costume designing, among several other domestic jobs. Being qualified in all these meant one was an excellent Kuchipudi dancer. The first superstar woman performer who emerged from this exercise was Yamini Krishnamurthi, a non Brahmin educated girl from an affluent family. She traveled the world and spread awareness on the dance form. She became a role model for scores of young girls to take to this dance. She proved that women were no less than men in Kuchipudi. On the other side, Vempati was churning out batches of students under the banner of his institution in Chennai. Inspired by Rukmini Devi’s Kalakshetra, he brought about a new level of sophistication into the dance form. He choreographed newer content to suit the female body. Some of his noted students like Sobha Naidu, Manju Bhargavee and Bala Kondala Rao were making waves across the dance world. Kuchipudi entered another phase when everyone began learning and performing it. Raja and Radha Reddy, a non-Brahmin dancer couple from current Telangana who initially trained in Kathak from Bangalore’s Maya Rao became trendsetters when they achieved national fame with Kuchipudi. They migrated and settled in Delhi, giving Kuchipudi a permanent place in the country’s capital. Till about this generation, the many points that Banda Kanakalingeshwar Rao’s notes made, were taken seriously. After that everyone began learning the dance form without any gender or caste differences. In fact, some of the non-Brahmin performers did a better job of presenting the dance form than those who came from a traditional family lineage. Those who hailed from a lineage had begun taking the dance form for granted. Over a period of time hardly any worthy name emerged from members of the traditional Brahmin families who took great pride in being custodians. While many ‘outsiders’ did manage to learn the technique of the dance form they were far from proficient as the earlier generation was. This was the first watering-down effect of the dance form itself. By the mid-1980s one saw Kuchipudi dancers who didn’t have half the merits they required. Dancers who were dancing without understanding the lyrics they were dancing to, dancers with zero sense of rhythm, dancers with zero sense of the music they were performing to and many more tropes invaded the space. The mediocrity that entered at this stage was to morph and grow with time. This dumbing down of the whole art form was to have more serious effects in the post-globalization era. Television took music and dance to homes far and wide. Everyone wanted to learn the dance form but few had the aptitude for it. Fewer were ready to work hard and remain of some standard. On the other side, the State of Andhra Pradesh was going through a severe political crisis. The Brahmin / Non-Brahmin divide was as strong as Hindu/Muslim or coastal Andhra/ Telangana. Andhra Pradesh under the NTR regime was a veritable mess for the world of arts and artistes. NTR did not like classical music, classical dance, books or writers. He dissolved all the academies. The Sahitya Akademi, the State Sangeet Natak Akademi and other bodies were dissolved to form a ‘Lalitha Kala Academy’. This hit the local artistes big! Many migrated overseas and many others outside of Andhra. The following governments led by NTR’s son-in-law Chandrababu Naidu and Congress rule under various CMs like Janardhan Reddy or Rajashekhar Reddy did nothing to revive these academies. The arts and artistes of Andhra were left in a state of neglect. The local government did not see it as a priority. Those artistes who migrated out of the State continued to prosper with their own efforts while those who stayed back were stuck. Over a period of time, those who did well for themselves managed to register in the national conscience. Inside Andhra another level of corruption began. Artistes who had money and could pull off some political influence began lobbying and getting awards. They entertained the political class with cash or in kind and received awards on a quid pro quo basis. This trend was there to stay. A long list of artistes whose actual artistic merit was highly questionable was seen bagging some top State and central awards. When the Central Sangeet Natak Akademi was established, one of its prime focuses was to ensure high standards of nurturing arts. 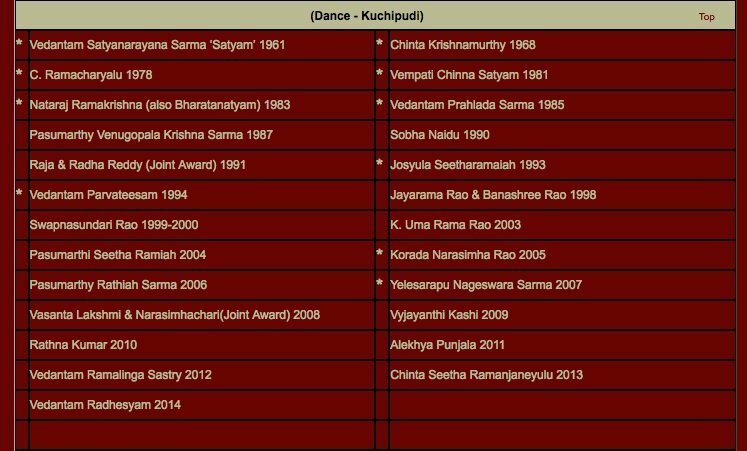 The earliest awards given in the Kuchipudi category were to artistes of great merit. The list is available for everyone to see. From 1961 till about few years ago, Vyjayanthi Kashi was the first non-Telugu artiste to be given the award. The grand daughter of Kannada theatre personality Gubbi Veeranna from Karnataka, Vyjayanthi had her training under a host of Gurus. Though she isn’t totally conversant in Telugu, she managed to learn the technique and style it to Kannada lyrics and so forth. The current SNA committee has five dancers on it - Bharatanatyam dancers Chitra Visweswaran and Malavika Sarukkai, Kuchipudi dancer Vyjayanthi Kashi, Kathak dancer Kamalini and Yakshagana dancer Shivananda Hegde. At this point let me inform you that if you file an RTI, you will be able to get the entire minutes of whatever meetings have been held. The meetings are also video recorded so an RTI from anyone would be able to give you the video footage as well. There are a few important questions to ask here: When there were so many dancers on the committee representing the dance fraternity in general, why were their opinions of dissent not considered? What are the parameters that the SNA has to decide on the merit of an artiste? We hear of several instances of committee members having done favours to someone they know. When artistes are on any committee, can they give awards to their students or relatives? Awards have also been given for age rather than for any artistic merit.What precedent is the SNA setting? Can the most prestigious awards in the country given by the official body of arts and letters, be ‘bought’ with anything but merit? Is there any transparency in these awards? Can we know who proposes whose name and on what basis for these awards? Our demands here are not big, except for asking for transparency. This is a democracy and this is a legible reasonable demand. 1. Can artistes who have a professional working relationship with anyone recommend their names? 2. Can members of the committee / any committee recommend names of their kith and kin? 3. In case of such malpractices, can the SNA withdraw awards that have been announced and not yet given? 4. Does the culture ministry hold the responsibility of advising the SNA? 5. Does the Prime Minister’s office hold the responsibility of advising the culture ministry? After the death of the last of the masters, i.e, Vedantam Satyanarayana Sarma, Vempati Chinna Satyam and Nataraja Ramakrishna, Kuchipudi has been going about like a headless chicken. With no guidance from any quarters and with so many wars inside the community of Telugus, the dance form is suffering. In the meantime, another jolt from the blue was the formation of the Telangana State. Kuchipudi village went to Andhra Pradesh. Those people in Telangana practicing Kuchipudi fell in the cracks. Being abandoned by the Andhras that they were not their people and being abandoned by Telangana that they didn’t practice a ‘local’ dance form, these Kuchipudi artistes were left to fend for themselves. At that point, did the SNA take cognizance of what was going on and how it could intervene to aid artistes and art? None that we know of. As the news of these latest SNA awards released on a hot April Sunday morning, the social media was abuzz with activity. The Kuchipudi community was angry and many veterans expressed their strong dissatisfaction against SNA’s current decision. Moreover, most of the people who expressed their angst were former awardees of the SNA. In fact the whole dance world was ‘stunned into silence.’ Why did Kathak get two Yuva Puraskars while there was no one from Odissi? How come even the small community of contemporary dance practitioners across the country don’t seem to have heard the name of the Yuva Puraskar awardee in the contemporary dance category?? Why was India’s national instrument missing from the awards list? There are many such questions. One would have expected the current SNA committee to give this a serious thought. Else the very credibility of the institution is under question. Does the SNA need an overhaul? A simple ‘Refresh’button? Under the current regime of PM Narendra Modi-ji and his culture ministry, one would have expected better, as the BJP claims to be great custodians of art and culture. But here is India’s premiere organization crumbling bit by bit, like Ravana’s effigy set on fire during Ram Leela and the artistes community is sitting and watching the whole fiasco helplessly. Will the government act now and bring in some level of transparency in the awards process? Otherwise they are no more or less corrupt than their opposition political parties. As yet another ‘World Dance Day’ comes around, I leave you with these questions. For now Kuchipudi, the once glorious dynamic and romantic form is on its deathbed. And the State and system are bent upon sending it to its grave. If the Kuchipudi fraternity doesn’t stand up now and fight for their rights, it might be too late! Dance, like prison service, is a law unto itself. What goes on behind bars and after lights-out is concealed from public gaze, in full confidence that the public does not want its illusions of security or stardom shattered. The saddest victims are the youngest, their shining ideals shattered by a corrupt system. The bigger loss is the decline of any art form. For any of this to be set right, the power of it lies with the State. Apropos to the article on Kuchipudi by Veejay Sai in the column ‘Roses and Thorns’, I would, in all humility, like to put forth a few points for thought. Pardon the length. Art per se, like all other fields, has never been a fair world and there have been numerous cases where undue recognition has been bestowed and due recognition delayed/refused. Just a few months ago, there was a big hue and cry about a young Kuchipudi dancer who was awarded the SNA’s Bismillah Khan Yuva Puraskar, while her parent was on the selection committee. Despite the beating-of-chests by artistes and many self-appointed dance patrons, the award was indeed bestowed. So much for fair play! It is but true that Kuchipudi is in that stage where there are almost no proficient performers who can command respect for their artistry. But this has indeed been the case with most art forms, which undergo a period of convalescence, if I may use that word, after the greatest of its legendary gurus pass away. It is a matter of sheer time till good performers emerge. For eg., how many star performers could Odissi boast of, say 15 years ago, before Sujata Mohapatra and the Nrityagram duo established themselves at the forefront? Or for that matter, even as of today, do art forms like Mohiniattam or Manipuri boast of dozens of star performers? The number of disciples flocking to learn an art form can rest on so many factors, including the availability of gurus, the rigours of training, even the rigours of make-up (like Kathakali) or simply providence. An art form can be termed “dead” (or dying) if: there are no more students of the art form in either the private or public institutions, or if there is nil patronage in terms of organizations featuring the art form, or if there is no audience for that particular art form. Considering that Kuchipudi passes the litmus test, so to speak, on all these counts, it is highly insensitive to use terms like “funeral procession,” “ICU,” et al. The angst of the writer, his well-meaning words of caution and efforts to galvanise the Kuchipudi community are definitely to be appreciated. But the shroud of pessimism could well be avoided. After all, art is for happiness.